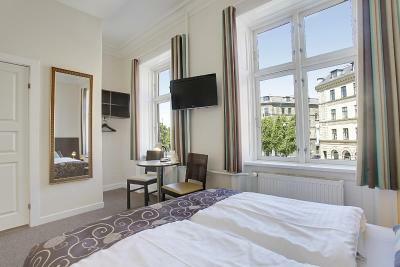 Location of the hotel is great with an easy walk to downtown Copenhagen or easily get to Frederiksberg Gardens. There are 2 bus lines (6A and 26) that are super close to the hotel so very easy to get around. Bed was comfortable and breakfast was great. Staff were all friendly. Great breakfast and some good cafes close by. 15 min walk to Tivoli/train station. If coming by train, take a taxi to the hotel if you have luggage. The staff was really helpful. They also have bikes to rent for the day at a decent price and some cool bike parking spots right outside where you can use the app bikes. It was a 10-minute bike ride from our event venue and a 30-minute walk. The beds were comfortable and breakfast was satisfactory. It was also very close the central station and metro and to attractions nearby. 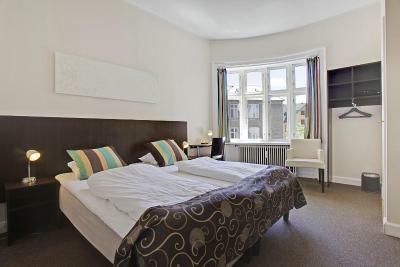 Brilliant location, very comfortable, coffee machine in the lounge, bus stop 100m from the front door (#26, which takes you to the centre and on to most attractions such as Nynhaven and the Little Mermaid), perfect Hotel for visiting Copenhagen. Having travelled on business to Copenhagen over 20 times, I can honestly say that the standard business hotels leave a lot to be desired. Over time, I have tried to stay out in the neighbourhoods more and Vesterboro is definitely a good choice for many reasons. This hotel is pretty standard, but my room was slightly bigger than I expected. Much like most three-star properties, the amenities are scarce, the beds and linens are serviceable. 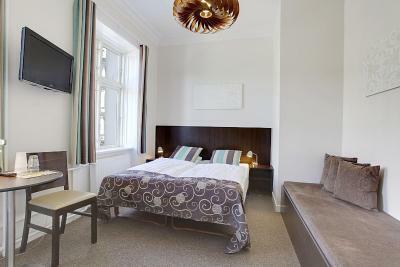 As long as you're aware that you're not getting luxury - you should enjoy this hotel, its fair price and lovely location. location was good and accessible, many great restaurants nearby. reasonable room size, bed was very comfortable. Hotel staff was extremely friendly and helpful! Excellent accommodations! Hotel Sct. Thomas This rating is a reflection of how the property compares to the industry standard when it comes to price, facilities and services available. It's based on a self-evaluation by the property. Use this rating to help choose your stay! 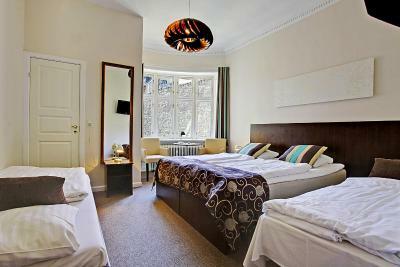 Situated in the vibrant district of Vesterbro, less than 15 minutes’ walk from Copenhagen Central Station and the Tivoli Gardens, this quiet hotel offers well priced accommodations and a popular breakfast buffet. Hotel Sct. 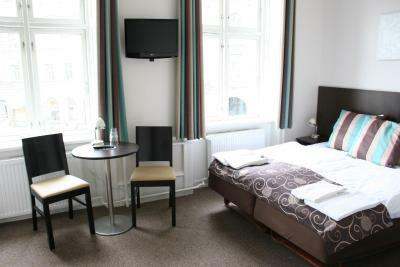 Thomas’s compact, modern rooms include satellite TV, a work desk and a private bathroom with shower. 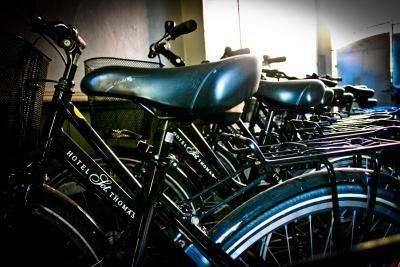 Bicycles can be rented on site. Local buses stop next to Sct. Thomas Hotel. The surrounding area has plenty of shops, bars and restaurants. Sct. 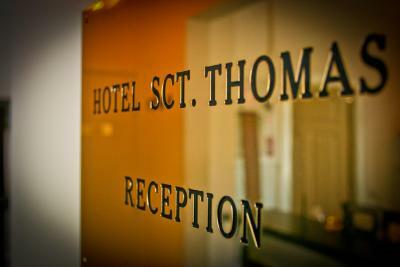 Thomas’s friendly staff can recommend dining options and sights to visit. 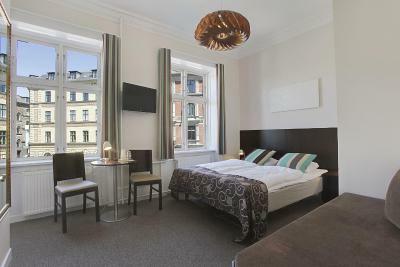 Vesterbro is a great choice for travelers interested in shopping, food and museums. 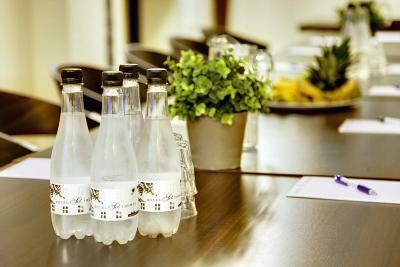 When would you like to stay at Hotel Sct. Thomas? Includes a work desk and a flat-screen TV with satellite channels. Has a work desk and a flat-screen TV with satellite channels. Children staying in this room must be under 12 years old. Modern loft apartment with an open-plan kitchen/living room, dining table and sofa. Children staying in this room must be 16 years or younger. The cozy Hotel Sct. Thomas is located in the old, unspoiled and idyllic theather district on Frederiksberg Alle in the middle of Copenhagen, near the city center, but tucked away from the major roads, the hotel is an in the perfect location to see the best of Copenhagen, and still a place to retreat to when you need peace and quiet. 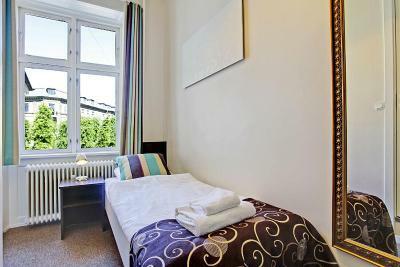 From the hotel, it is quick and easy to get to the famous Tivoli Gardens, as well as many great Danish restaurants, shops and other attractions. The central station is also nearby, so you can visit the rest of the city and points beyond. Hotel surroundings – This neighborhood is a great choice for travelers interested in shopping, food and museums – Check location Great location - show map Guests loved walking around the neighborhood! House Rules Hotel Sct. Thomas takes special requests – add in the next step! Hotel Sct. Thomas accepts these cards and reserves the right to temporarily hold an amount prior to arrival. If you expect to arrive after 18:00, please inform Hotel Sct. Thomas in advance. Please note that there is a 2.2% charge when you pay with a foreign credit card. Hotel Sct. Thomas requires that the credit card holder’s name matches the guest’s name on the booking confirmation. Guests are required to show photo identification and the same credit card used for booking upon check-in. 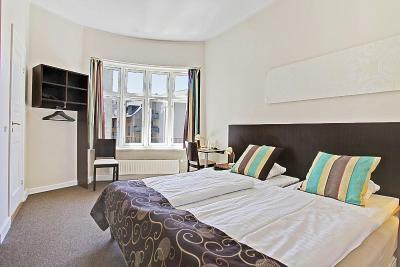 If you wish to book for another individual, please contact the property directly for further information after booking. When booking more than 4 rooms or if the total amount due is 10 000 DKK, different policies and additional supplements may apply. Please inform Hotel Sct. Thomas of your expected arrival time in advance. You can use the Special Requests box when booking, or contact the property directly using the contact details in your confirmation. The breakfast had immense variety to chose from, with top quality products. The room was very small but extremely cozy! I even dare say it was cute, considering the size, but everything fitted perfectly! 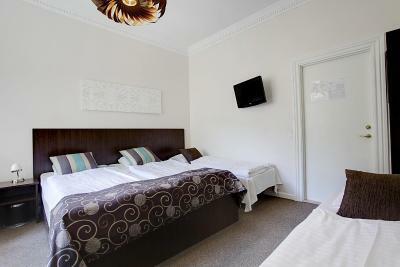 I had only a one night stay, and indeed for short stays this hotel was perfect! The staff was very friendly too, excellent place to stay for a few nights. For the end of a business trip combined with a bit of leisure it was great. The breakfast area has many tables where informal talks can easily take place, if your goal is mainly business. 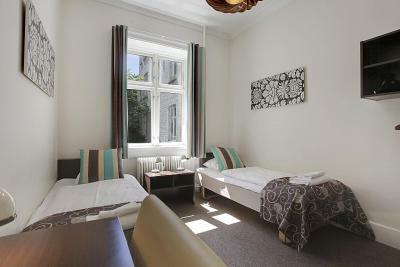 However, the location itself is quite central, so if you go only for leisure, or you simply want to take in an extranight or two after or before business meetings, you can also easily go for a stroll to the city center, or to Nyhavn, some closeby parks, whatever you want. Tivoli theater, the Zoo, circus, everything in close proximity and walking distance! 11/10 for me! We wanted to avoid the 2.2% foreign credit card fee, but was not allowed to pay in cash upon check in which was disappointing. 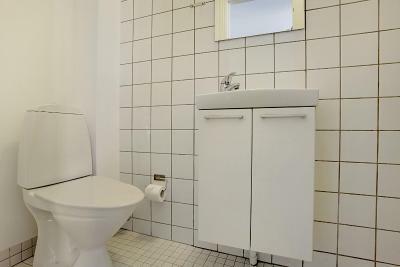 The bathrooms are tiny, and difficult to move around in. The walls are really thin. The last night we were there I could hear the guests in the next room talking and snoring, making it poor nights sleep. Would have been nice to have a tea/coffee maker in the room. The breakfeast was awesome, especially the rolls and fresh fruits. It was my second stay in the hotel. Very friendly staff and a quiet room. Perfect location, so many brilliant cafes and restaurants, cocktail bars close by. Hotel was very clean, neat and comfortable. They had a full functioning hairdryer in the room which was handy too. Staff where incredibly accommodating and nothing’s was too big an ask. The hotel is dated and needs a remodel. There is a lot of noise coming from the doors, they are so heavy so they slam into the wall and it is happening all the night so you don't really sleep well. Also the walls are so thin at one point at the night I could hear my neighbours talking clearly. The hotel is very old fashioned and modest. 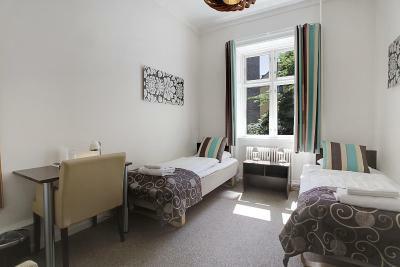 The rooms are not sound proof, you can here all the noises from the corridor and the neighbouring rooms. The carpets are dusty, the hotel isn't definitely for people with allergy problems. The staff was nice. The breakfast was goos. Breakfast was a bit poor. Because of very old water net I couldn't catch the right temperature of water sometimes cold sometimes hot while taking bath..
Staff was nice , helpful. Room was clean. The cleaning, especially of the bathrooms, was a disapointment. Beautiful room. Good breakfast and nice staff.